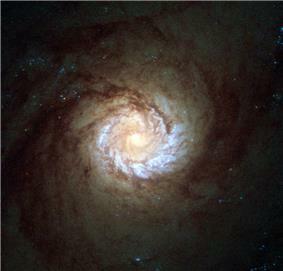 Messier 61 (also known as M61 or NGC 4303) is a barred spiral galaxy in the Virgo Cluster. It was discovered by Barnabus Oriani on May 5, 1779. It has an Active galactic nucleus and it is classified as a starburst galaxy, with a candidate supermassive black hole with a mass around 5 million times that of our Sun on its center. This object is associated with a young, massive star cluster with a mass 100,000 times the one of the Sun, a radius of 3.1 parsecs and an age of 4 million years. Surrounding it, there's a nuclear spiral with a radius of 225 parsecs formed by several massive star-forming regions, that may be associated with a second bar much smaller than the main one of this galaxy. 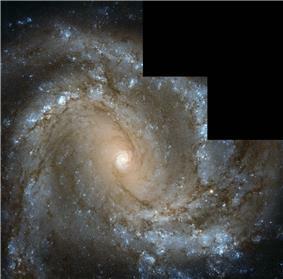 Star formation is also high across M61's disk, perhaps due to interactions with her satellite galaxies NGC 4292 and NGC 4303B. ^ Tschöke, D.; Hensler, G.; Junkes, N. (2000). "X-rays from the barred galaxy NGC 4303". ^ a b c d e f g h i j k l m n "NASA/IPAC Extragalactic Database". Results for M 61. Retrieved 2006-11-18. ^ Jiménez-Bailón, E.; Santos-Lleó, M.; Mas-Hesse, J. M.; Guainazzi, M.; Colina, L.; Cerviño, M.; González Delgado, Rosa M. (2003). "Nuclear Activity and Massive Star Formation in the Low-Luminosity Active Galactic Nucleus NGC 4303: Chandra X-Ray Observations". ^ Pastorini, G.; Marconi, A.; Capetti, A.; Axon, D. J.; Alonso-Herrero, A.; Atkinson, J.; Batcheldor, D.; Carollo, C. M.; Collett, J.; Dressel, L.; Hughes, M. A.; Macchetto, D.; Maciejewski, W.; Sparks, W.; van der Marel, R. (2007). "Supermassive black holes in the Sbc spiral galaxies NGC 3310, NGC 4303 and NGC 4258". ^ Colina, Luis; Gonzalez Delgado, Rosa; Mas-Hesse, J. Miguel; Leitherer, Claus (2002). "Detection of a Super-Star Cluster as the Ionizing Source in the Low-Luminosity Active Galactic Nucleus NGC 4303". ^ Colina, Luis; Garcia Vargas, Maria Luisa; Mas-Hesse, J. Miguel; Alberdi, A.; Krabbe, A. (1997). 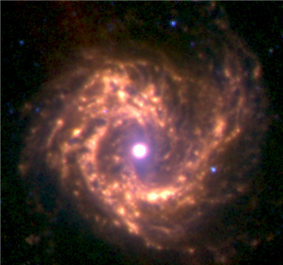 "Nuclear Spiral and Ring Star-forming Structures and the Starburst--Active Galactic Nucleus Connection in Barred Spirals NGC 3351 and NGC 4303". ^ Schinnerer, Eva; Maciejewski, Witold; Scoville, Nick; Moustakas, Leonidas A. (2002). "Toward the Secondary Bar: Gas Morphology and Dynamics in NGC 4303". ^ Koopmann, R.; Kenney, J. D. P. (2004). "Hα Morphologies and Environmental Effects in Virgo Cluster Spiral Galaxies". The Astrophysical Journal 613 (2): 866–885. ^ Cayatte, V.; van Gorkom, J. H.; Balkowski, C.; Kotanyi, C. (1990). "VLA observations of neutral hydrogen in Virgo Cluster galaxies. I - The Atlas". ^ Kenney, J. D.; Young, J. S. (1986). "CO in H I-deficient Virgo cluster spiral galaxies". 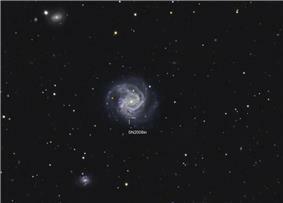 ^ "Supernova in M61 (NGC 4303)". http://remanzacco.blogspot.it/. Retrieved 1 November 2014.